Adverse drug reactions and drug interactions are common in renal failure. Since most drugs and drug breakdown products are excreted via the kidneys, even partial loss of kidney function alters the response to a given dose. 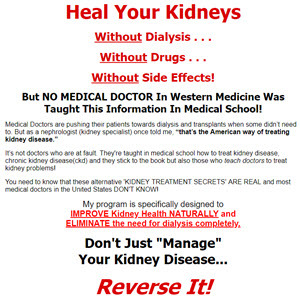 Kidney disease may change not only drug elimination, but also drug absorption and distribution throughout the body. One such effect often observed is diminished protein binding of drugs in the plasma, owing to low serum albumin level, thereby increasing the concentration of free drugs in the blood. The amount of free drug in the blood is responsible for the drug's effects. If you take a given dose of drug, the extent to which the drug gets bound to your serum albumin will have a major effect on your response: The less drug that gets bound to albumin, the greater the drug's effect on your body. Thus a lower dose of the drug may be better for you. In other cases, a metabolic product of the administered drug is responsible for its effects. One such example is meperidine (Demerol), which is converted to normeperidine, the metabolite that combats pain; Demerol itself does not combat pain. But normeperidine can accumulate in patients with renal failure and result in seizures. Patients with kidney failure should avoid using, if possible, two classes of drugs: nonsteroidal anti-inflammatory drugs (NSAIDs), and steroids.